The International Music Score Library Project (IMSLP), also known as the Petrucci Music Library after publisher Ottaviano Petrucci, is a subscription-based project for the creation of a virtual library of public domain music scores, based on the wiki principle. Since its launch on February 16, 2006, over 370,000 scores and 42,000 recordings for over 110,000 works by over 14,000 composers have been uploaded. The project uses MediaWiki software to provide contributors with a familiar interface. Since June 6, 2010, IMSLP has also included public domain and licensed recordings in its scope, to allow for study by ear. The site was launched on February 16, 2006. The library consists mainly of scans of old musical editions out of copyright. In addition, it admits scores by contemporary composers who wish to share their music with the world by releasing it under a Creative Commons license. One of the main projects of IMSLP was the sorting and uploading of the complete works of Johann Sebastian Bach in the Bach-Gesellschaft Ausgabe (1851–99), a task that was completed on November 3, 2008. Besides J.S. Bach's complete public domain works, all public domain works of Ludwig van Beethoven, Johannes Brahms, Joseph Canteloube, Emmanuel Chabrier, Ernest Chausson, Frédéric Chopin, Joseph Haydn, Arcangelo Corelli, Claude Debussy, Vincent d'Indy, Paul Dukas, Gabriel Fauré, Pierre-Octave Ferroud, George Frideric Handel, Jean Huré, Albéric Magnard, Giovanni Pierluigi da Palestrina, Maurice Ravel, Albert Roussel, Erik Satie, Florent Schmitt, Franz Schubert, Robert Schumann, Alexander Scriabin and Jean Sibelius are available as well as a large percentage of Wolfgang Amadeus Mozart, Franz Liszt, and the works of many others as well. Besides providing a digital repository, IMSLP offers possibilities as a musicological encyclopaedia, since multiple and historical editions of a single composition can be uploaded. Also, pages on publishers provide valuable information, and the work pages themselves often contain a large quantity of information, e.g. roles in an opera. The blue letter featured in Petrucci Music Library logo, used in 2007–2015, was based on the first printed book of music, the Harmonice Musices Odhecaton by Ottaviano Petrucci. In 2007–2015, IMSLP / Petrucci Music Library used logo based on a score. The score image in the background was taken from the beginning of the very first printed book of music, the Harmonice Musices Odhecaton. It was published in Venice, Italy in 1501 by Ottaviano Petrucci, the library's namesake. In 2016, IMSLP changed its logo to a clean wordmark, featuring its two project names – IMSLP and Petrucci Music Library. In 2009, IMSLP won the MERLOT Classics award for Music. It was named one of the Top 100 Web Sites of 2009 (in the "Undiscovered" subsection) by PC Magazine. In response, director Michael S. Hart of Project Gutenberg offered support to keep the project online. This offer was declined by Feldmahler, who voiced concern about having the project hosted in the United States, and consulted the Canadian wing of Project Gutenberg. On November 2, 2007, Michael Geist, a prominent Canadian copyright academic, wrote an article for the BBC discussing the specifics and the wider implications of this case. 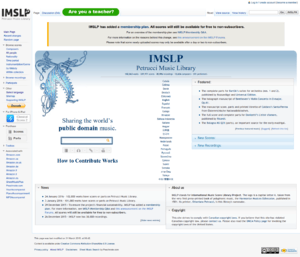 IMSLP went back online on June 30, 2008. Since its reopening, IMSLP has been using a strict copyright policy, where uploaded files are only made accessible for download after the copyright status for three most frequent copyright regimes has been reviewed by staff members. Although the server is located in Canada, files which are not public domain in the US were until July 2010 flagged [TB], for 'Technical Block' or 'Temporary Block', and could not be viewed. The FAQ posted in their forum stated, "Unfortunately, these 'temporary' blocks will be until further notice – possibly all the way until the expiration of term in the USA." After an initial phase, [TB] flagged items have essentially disappeared thanks to the introduction of regional servers operated by unaffiliated organizations (see next). On December 27, 2015, IMSLP moved to a subscription-based model, where users are expected to pay to avoid a waiting period on some of the files available on IMSLP, and to access certainly newly uploaded files. Users who have not paid are subject to a 15-second waiting period on certain files (excluding Creative Commons-licensed files that constitute a majority of files on IMSLP), are required to wait up to two days to access newly uploaded files, and are shown advertising. Music commentator and critic Norman Lebrecht described in a blog post a few days after the change that the change was met with a "rising surge of anger amongst composers and musicians". The project leader Edward Guo claimed the changes were made because the level of funding was "not sustainable in the long run", but also noted that funding had previously "been enough to maintain the site". Guo attributed the change in funding to discussions with librarians at an IAML conference in June 2015. Some contributors to the website expressed concerns that Guo had not properly attempted to raise donations, but without any prior warning, introduced the membership system to monetize their work. As of January 2016, Guo has refused to release any information about the company's accounts, triggering concerns that users could not guarantee their donations are actually needed. On April 18, 2016, IMSLP announced on its Twitter account that all subscribers will have access to the Naxos Music Library. On July 10, 2010, a forum thread announced the opening of a new server, located in the Netherlands. This server allows works which are public domain in Canada and the EU to be downloaded legally, even if they are under copyright in the US. The server was initially run by an unaffiliated European organization, while a forum thread  later announced that operations had been handed over Project Leonardo, a new unaffiliated company incorporated in New Zealand to "provide web hosting services to online libraries that distribute free contents in any fields of arts and science". Files on the EU server are flagged (EU). A similar, also unaffiliated US server allows users to download works public domain only in the US. Unlike the other servers, this one can only be contributed to by administrators and users who have asked for the privilege, though the files are freely accessible for download. On August 23, 2011, an announcement was made that the Werner Icking Music Archive would merge with IMSLP. WIMA had announced the merge on its own site five days before in an open letter to contributors. After working out some technical issues, IMSLP decided to officially commence the merge on August 28. The merge was announced to be complete on July 21, 2012. Choral Public Domain Library: focused on choral and vocal music. Mutopia Project: focused on typeset scores. ↑ Moore, Christie (2007-01-05). "Wiki of public domain classical scores". MIT Library News. Retrieved 2007-11-06. ↑ Quist, Ned (2007). "Selected internet resources for music". Brown University Library. Retrieved 2008-09-04. ↑ "Musical Scores". University of Washington Libraries. 2007. Retrieved 2008-09-04. ↑ Clark, Ken (2007-10-05). "Cease and Desist Letter from Universal Edition AG" (PDF). Aird & Berlis LLP. Retrieved 2007-10-20. ↑ "FAQ Works in TB Status". Retrieved 2010-05-22. ↑ "IMSLP music library introduces paid membership – The Strad". The Strad. 2016-01-04. Archived from the original on 2016-01-14. Retrieved 2016-01-14. ↑ Lebrecht, Norman (30 December 2015). "Musicians are made to wait as free score site goes pay-for". Slipped Disc. Retrieved 30 December 2015. ↑ "Project Leonardo". Retrieved 2013-07-07. ↑ "Anniversary and Canadian server announcement". Retrieved 2013-07-07. ↑ "IMSLP to merge with WIMA". Retrieved 2011-08-28. ↑ "WIMA merges with IMSLP, the International Music Score Library Project". Retrieved 2011-08-28. ↑ "IMSLP to merge with WIMA". Retrieved 2012-07-21. ↑ "IMSLP-About – IMSLP/Petrucci Music Library: Free Public Domain Sheet Music". Retrieved 2009-05-29.